The impact of the Brexit decision on the British economy has been limited so far. However, we expect a rise in Brexit-related insolvencies in the UK of 4% this year and in 2018 as negotiations with the EU intensify. These expectations may have influenced British respondents’ decisions about selling on credit terms but also the increase we are seeing in respondents doing more to protect their businesses against credit risks. After a slight decrease in sales on credit terms in 2016, the total value of B2B sales on credit in Great Britain increased again this year. Among the Western European countries surveyed, respondents in Great Britain (45.7%) are some of the most inclined to sell on credit terms. On average, 48.6% of the sales to domestic B2B customers were transacted on credit. This percentage is slightly higher than the one reported in last year’s survey (48.2%). A higher increase was observed with sales to foreign B2B customers. On average, 42.8% of the total value of B2B sales to foreign customers was transacted on credit (2016: 40.3%). 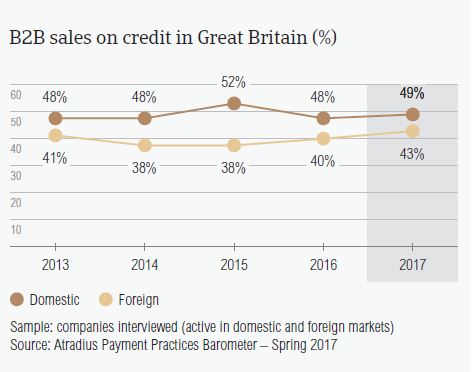 Like their peers in Western Europe, British respondents seem more averse to selling on credit to foreign B2B customers than to domestic customers. Both percentages of B2B sales on credit in Great Britain are higher than the regional averages (domestic: 42.6%; foreign: 35.1%). 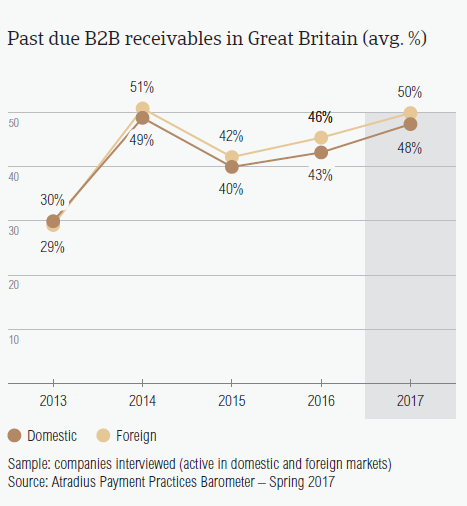 In 2017, the percentage of domestic and foreign past due B2B receivables in Great Britain saw an upswing. This follows a slight increase in 2016 and seems to underline an upward trend. 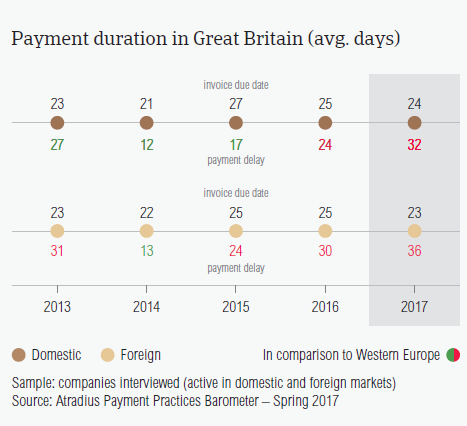 British respondents reported late payments from their domestic and foreign B2B customers (87.9%) less frequently than one year ago (91.1%). The decrease seems to be a result of fewer late payments by overseas customers (86% in 2017, down from 92% in 2016). More than half of the invoices of respondents in Great Britain were not paid by the due date (49%). This is four percentage points higher than in 2016 and higher than the 41% regional average. While in 2016, the increase in late payments was mostly a consequence of late foreign payments, in 2017, the trend appears to have reversed with more late payments by domestic B2B customers. Late payment of invoices (domestic and foreign) is reflected in the Days Sales Outstanding (DSO) figure posted by British respondents. This averages 31 days (survey average: 44 days) and is four weeks less than last year. Looking forward, most British respondents (61.3%) do not expect a change in their average DSO over the next 12 months and 20.1% expect a slight increase. B2B trade credit payment terms extended by British respondents average 23 days from the invoice date (significantly under the 32 days survey average) and are the shortest across the Western European countries surveyed. Compared to one year ago, payment terms granted to domestic B2B customers (24 days) appear to be, on average, one day shorter. Payment terms granted to foreign B2B customers (23 days) are also shorter this year, on average, by two days. The strong emphasis on swift invoice payment observed in Great Britain was also seen in Denmark, Germany and the Netherlands (average payment terms: 24 days), and Austria (25 days). In 2017, there was a decrease in the speed of payment from both domestic and foreign B2B customers. Domestic B2B customers paid on average, 32 days from the invoice date – eight days later than in 2016. Similarly to what was observed in 2016, foreign B2B customers had longer payment delays than domestic B2B customers. The average foreign payment delay stood at 36 days from the invoice date (2016: 30 days). Despite the shorter DSO, which may suggest invoices of higher value being collected faster, British respondents’ invoice to cash turnaround increased to an average of 57 days from 52 days last year. Domestic B2B customers of respondents in Great Britain delayed payments most often because of liquidity constraints (42.6%), while foreign B2B customers postponed payments most often because of the complexity of the payment procedure (35.7%). British respondents stated payment delays were due to insufficient availability of funds more often in regards to their domestic B2B customers (42.6%) than their foreign B2B customers (31.2%). This reason for payment delays was stated less often than in Western Europe overall (domestic: 52.6%, foreign: 34.5%). Great Britain had the highest percentages of respondents who cited that payment delays occurred most often because the goods delivered or services provided did not correspond to what was agreed in the contract. More specifically, 26.2% of British respondents stated this in respect to their domestic B2B customers and 31.2% in respect to their foreign B2B customers. 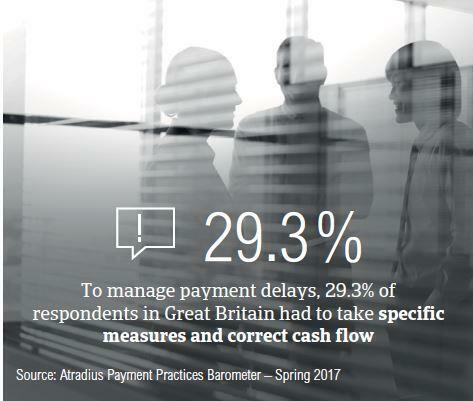 To manage payment delays, 29.3% of respondents in Great Britain said that they needed to take specific measures to correct cash flow. 20.9% of respondents said that they needed to pursue additional financing from banks and factors. Along with respondents in Germany (22.9%), Spain (22.4%) and Italy (21.9%), British respondents (21.0%) plan to do more to protect themselves against the potential negative effects of Brexit, the slowdown in Asia and US protectionism. A higher percentage of respondents in Great Britain (52.6%) than in Western Europe (48.3%) stated that they will not change their current mix of credit management tools to protect their businesses against the risks of payment defaults. However, a higher percentage of British respondents (21%) stated their intention to increase their usage of credit management techniques (Western Europe: 18%). To increase protection, British respondents are more likely to monitor buyers’ credit risk (25%) and increase checks on buyers’ creditworthiness (24.7%) than they are to use a collections agency (17.8%), increase bad debt reserves (18.3%) and use credit insurance (19%). 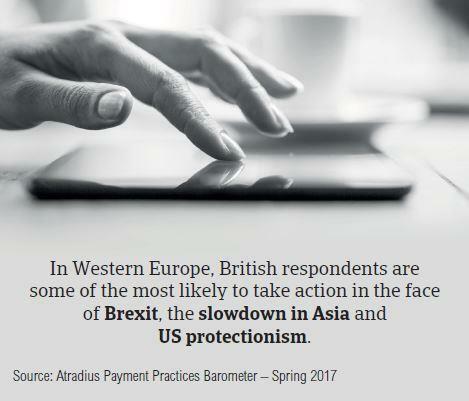 The most likely actions that British respondents would take to protect their businesses from the impacts of Brexit, the slowdown in Asia and US protectionism include increasing checks on their buyers’ creditworthiness (Brexit: 27.7%, the slowdown in Asia: 20.7%, US protectionism: 25.7%) and monitoring their buyers’ credit risk (Brexit: 27%, the slowdown in Asia: 19.4%, US protectionism: 28.6%). More B2B receivables were written off as uncollectable in Great Britain this year (1.7%) than in 2016 (1.4%). 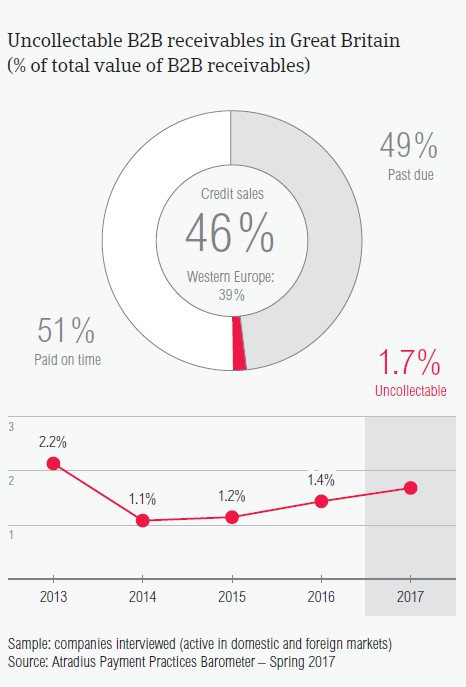 The total average value of B2B receivables written off as uncollectable in Great Britain (0.8%) is slightly higher than that registered in Western Europe overall (0.6%). Similarly to what was observed in previous surveys, uncollectable receivables consisted primarily of domestic write-offs (domestic: 1.2%; foreign: 0.5%). This year, the largest proportion of uncollectable receivables originated from the construction, chemicals and business services sectors. The main reason for write-offs were the customer going bankrupt (56.7%) and the failure to locate the customer (34.6%). 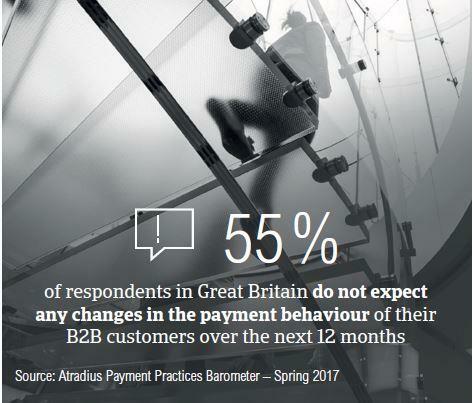 29% of respondents in Great Britain expect payment practices of their domestic and foreign B2B customers to deteriorate slightly over the next 12 months. According to survey findings, most of the industries British respondents trade with, were given payment terms close to the country average (23 days) or less. The exception is the machines industry, where B2B customers enjoyed longer payment terms of 40 days, on average. The shortest payment terms, on average, are offered extended to B2B customers in the consumer durables (average payment terms 14 days), financial services and construction materials industries (both with average payment terms of 15 days). B2B customers in the services industry delayed their payments the most (on average, 81 days from the invoice due date). Other payment delays were generated in the business services (70 days) and chemicals (46 days) industries. British customers said that B2B customers in the services industry delayed their payments mainly because of the complexity of the payment procedure (46%) and because of the buyers’ use of outstanding invoices as alternative financing (46%). The main reason for payment delays in the business services sector was liquidity constraints (cited by 35% of respondents) and in the chemicals sector it was incorrect information on the invoice (41%).